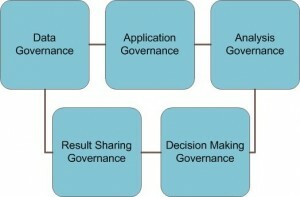 Governance must be one of the least celebrated aspects of business. Talking about it makes people roll their eyes, and rarely anyone likes to be involved in governance projects. Why should they? Isn’t it governance talking about how business is conducted, and not just actually doing it? Why discuss about all that when there are so many more pressing matters to attend? Anyone who follows the Marketing Analytics scene knows that a good 90% of what is discussed (well, OK, I didn’t measure this) is around technology, and Big Data, which is a fancy new way to say technology. However, you can buy all the technology in the world, but if you don’t work hard on how it will be used, by who, for whom, when, what for, and why people should care, your analytics function is doomed to fail, or at least take way more time before the rubber really hits the road. Governance, to put simply, is the explicit set of policies that will determine how an activity will be conducted, and how it will be evaluated. 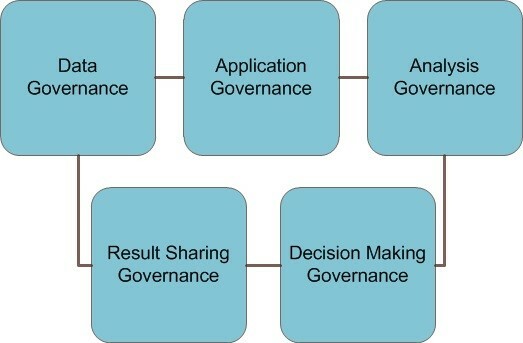 In my ten years in Digital Analytics consulting, I have seen very few organizations where its governance had been actually addressed in a formal way. Today, and in the next five months, I will discuss that question, hoping this series of articles will contribute to convincing you of its importance. Although there is no order, nor direction, since everything needs to be addressed, I do put some emphasis on Analysis Governance as the corner stone. In the following issues, I will discuss each one of them in details. But for now, a few words about what they mean. This part of governance concerns everything about the data the organization collects: what they are, what systems generate them, how clean they are, how we handle archiving, etc. Since without data there is no analysis, businesses should treat data as an asset, and thus handle them the same way they handle other assets. Obviously, what happens to data will impact the entire analysis chain. I believe most businesses of a certain size have been rather good at handling this dimension of governance. This is without a doubt where we witness most of the current focus of the market, most probably due to the fact that markets tend to be dominated by vendors who will do their best to influence the conversations. This part of Governance handles the technological dimension of the analytical function. What solutions should we implement? How many skills around those solutions will we need to internalize? How will we manage obsolescence cycles? It is very tempting to give to this dimension way more weight than it truly deserves, and this is often because this is where most organizations will spend most of the money, sadly. What is our analysis framework, i.e. on what metrics will we base our analysis? This is where KPIs sit. I believe it to be the most important dimension of Marketing Analytics governance, because everything starts here, or at least should. In reality, most businesses will purchase technology and spend a number of years using it before realizing it’s not delivering on its promises. Ninety five percent of the time (again, a made up number, but you get my drift), it is because those organizations didn’t do their homework at this level. Simply put, what is Analytics supposed to be and deliver if you don’t have an explicit, agreed upon set of success metrics? Which technology are you even supposed to acquire if you don’t exactly know what to measure? This is one big neglected part of Analytics Governance. I have seen very few companies that had systematically addressed this dimension; having dashboards certainly is not enough. How will we communicate results? When and in what format? The most common complaint I hear from analysts is that nobody reads their reports. If you identify to this, you have a strong indicator that you need to work on this aspect of governance. You can spend all the money you want on handling the data, on data processing technology, on result analysis talent; if you don’t take very good care of result sharing governance, all will be most likely for naught. Now, this is one area on which I still need to see companies seriously work. Are people officially accountable for making decisions based on analytics output? If a manager decides not to follow recommendations, or even the data (believe me, it happens), are there mechanisms that officially record it? In short, are we becoming a learning organization? This poses all the questions about performance measurement (here I mean people, folks! ), accountability, and, yes, culture. I know, this is a rather vague concept, and one reads everywhere that companies should create measurement cultures, but we never see how exactly they are supposed to go about that. I will offer my own answers in a few months. So, here we are. In the next five issues, I will dig deeper in each of the item I listed today, and present some ideas I hope will be useful to you, especially if you are in charge of making sure analytics is a success in your organization. In the meantime, I invite you to join the discussion here on this newsletter LinkedIn Group.